Jesse Esparza stands tall as he squints into the afternoon sun. He doesn't quite fill the dark suit that hangs from his shoulders, and his hands, clasped together before his waist, only half-emerge from their sleeves. Behind him stretches Stockton's Southside, the most distressed section of the most violent city in California. Jesse tells the story of the white ribbon tied at the base of a small oak tree in McKinley Park. It's a tragic storythe senseless murder of a friend's cousin, a teenager caught up in a cycle of retaliationsand his telling is both somber and matter-of-fact. But where the trauma gets particular, he generalizes, describing the way news like this travels on seismic waves through his community. "You're in shock," he explains. "You're in denial, you don't want it to be true. You're hoping it's someone else." At 18 years old, Jesse has already been through this set of emotions more times than would be fair in a full lifespan. One might say he possesses a wisdom beyond his years, though its acquisition is troubling. In a quiet moment of reflection, Jesse's eyes search the blades of grass as if for answers. His skin is smooth, almond colored, his face open and strong. He seems to play an image in his mind for a few moments before looking up again, lifting his eyebrows. He reaches for words to fill the silence and lights on a stock phrase. "It's pretty crazy," he says. He repeats this again and again over the next hour, the only words he can find to move past each newly risen memory as a casual drive through his old neighborhood transforms without notice into an impromptu ghost tour. The points of interest form a web of violence, dozens of vague memorials to those friends who will never have a chance, as Jesse has, to break through. As Jesse speaks to the overflowing room about programs that forever changed the course of his life, the legislators hang rapt on his every word. The day has been a long one. All morning Jesse has been talking change politics with some of the most engaged men and women in the state. It's the Fourth Annual Stockton Summit of the Alliance for Boys and Men of Color, a decentralized coalition of organizations working at all levels of civic engagement for policy changes that will improve the lives of young Californians. In one report after another, data show young men of color face more systemic barriers than their white peers, making them much more likely to drop out of high school, serve time in prison (or juvenile hall), be unemployed, and ultimately die young. The situation, according to those involved, is dire. The Alliance is the first of its kinda statewide network connecting young men like Jesse Esparza to a chain of influence that includes everyone from the grassroots to the upper echelons of policy and philanthropyuniting scores of diverse organizations under a single political banner. In its first three years, the Alliance has grown with startling momentum. Jesse is connected through Fathers & Families of San Joaquín, a Stockton-based nonprofit and one of the local partners in the Alliance. And like most of the partners statewide, Fathers & Families began its work years before the Alliance was formed. Executive Director Sammy Nuñez founded Fathers & Families just over a decade ago after recognizing in himself a cross-section of the needs of his community, needs that were not met for him until it was almost too late. Nuñez is an animated man with an infectious smile who greets both old friends and new acquaintances with a warm embrace of his left arm. He keeps his right hand in the pocket of his neatly pressed trousers. "Lead poisoning," he explains. "Shotgun shells are bad for your health." It's a sly reference to a near-death experience he had as younger man. He is a quick study of character and moves constantly throughout the day, playing activist matchmaker for strangers in whom he sees common interests. By lunch, his energy and compassion have reached nearly everyone at the Summit. In California, for many years, young men of color were seen as public enemy number one. Our mission is to get people to see young men of color as actually the answer to California's problemsyouth as protagonist for the policy work. 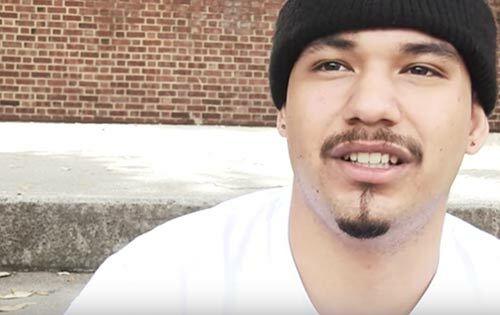 Nuñez speaks with candor about his time cycling in and out of incarceration as a youth, and his enthusiasm builds as he talks about the group of mentors who showed him a more healthful path forward. "It was through this process I met many of my current guides and teachers that are grounded in what we call La Cultura Curaculture cures." Nuñez says these men seemed strange at first, unfamiliar. "They didn't gather with a joint or with a beer, they gathered and talked about real important issues. And so I found myself getting drawn to this." At 39 years old, he now finds himself a serious agent of change, as a political actor and as a personal mentor, introducing young men like Jesse Esparza into the kind of positive cycle that can lead to transformational healing. A year after meeting Nuñez, Jesse now works as the Youth Organizer for Fathers & Families, a role that has brought him to today's Summit to testify before members of the State Assembly. As Jesse speaks to the overflowing room about programs that forever changed the course of his life, programs started by Fathers & Families and supported by the work of the Alliance, the legislators hang rapt on his every word. 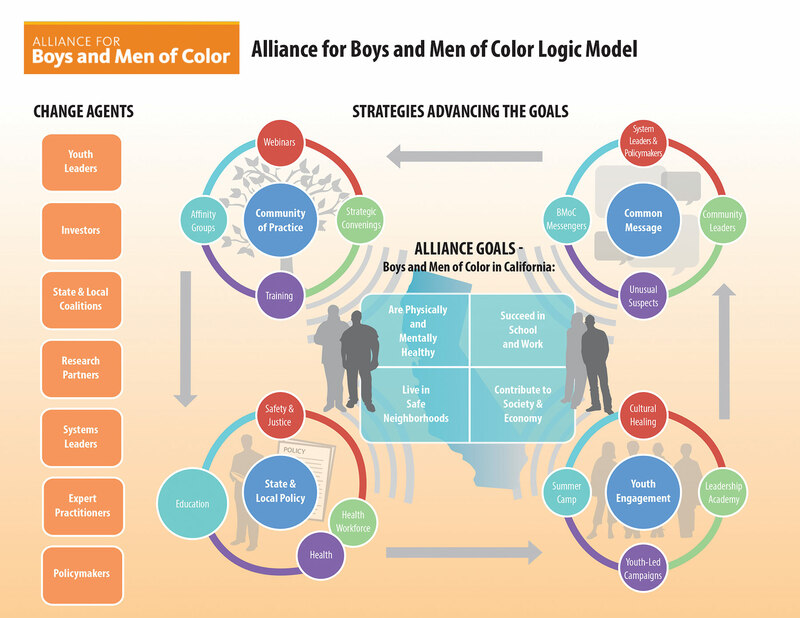 The Alliance for Boys and Men of Color targets four key issue groups: workforce development, equity in education, fairness in the criminal justice system, and improved health and well-being. These are the issue groups that link Fathers & Families with others across the stateorganizations like Urban Strategies Council in Oakland or the Building Healthy Communities Hub in Fresno. The Alliance began in 2011 and is still strong in its three original cities: Los Angeles, Fresno, and Oakland. But within the last year, the Alliance has grown in places like Stockton, Sacramento, Salinas, Santa Ana, and Coachella. While the Alliance can seem abstractcomprised of these myriad local partners, convened by a handful of state partners, controlled by no single entity, and responsible to no one agenda beyond the broad goal of improving the lives of boys and men of colorthe work being done in its name is deeply concrete. "The state partners have an accountability to the local campaign work, to support it as needed," says Rubén Lizardo, senior director at Oakland-based PolicyLink, one of the state-level partners of the Alliance. "The people who get credit for actually engaging youth and reclaiming them, whether it's about healing, or helping them to become activists, those are the base-building groups at the local level." As Lizardo talks about the strategies of the Alliance, he switches seamlessly between rendering a kind of architectural diagram and citing details from the recent youth-led legislative actions that give it flesh. Throughout, he is emphatic about one thing: the youth must hold the center. "In California, for many years, young men of color were seen as public enemy number one. Our mission is to get people to see young men of color as actually the answer to California's problemsyouth as protagonist for the policy work." So far this strategy seems to be effective. Last year, 13 of the Alliance's priority bills were signed into law. Another three were passed through both houses and then vetoed at the Governor's desk. As for targeted issues like school discipline reform (which is part of the strategy to improve education equity, but also lies at the intersection of criminal justice, health, and workforce development), Alliance partners have supported seven related bills in three years. Five of these were signed into law, including the groundbreaking AB 2537, which returns discipline discretion to local schools in certain cases where former statewide "zero tolerance" policies would have mandated expulsion. All of these bills directly involved the work of a few key lawmakers in the State Assembly who sit on its bipartisan Select Committee on Status of Boys and Men of Color in California. "One of the more powerful partnerships we've developed in the past few years is the partnership that we have with the California legislature," says Ray Colmenar, Senior Program Officer at The California Endowment. TCE is one of the main funding partners of the Alliance, and a leading advocate of health issues for communities of color across the state. "California's future is in color," Colmenar says. "We think America's future is going to be in color. And so we have to support everybody." To foster the collaboration, the Select Committee, in partnership with the Alliance, holds hearings like the one in Stockton, where local and regional leaders, including youth, have a chance to speak directly to its members. Recalling last year's round of hearings, Colmenar says, "[They] ultimately culminated in a set of policy recommendations that the Select Committee is now trying to advance in the state Legislature. One of the key outcomes of that work has been the engagement of thousands of residents and leaders throughout California." This seems to be key in the success of the Alliance: partner at all levels, preserve the identity of the groups involved, engage youth in leadership, and communicate a unified message. Engagement and communication feed back into the cultivation and expansion of the partnerships, so that the result is policy and system change carried out in a community of practice. The Select Committee is currently chaired by Assemblymember Steven Bradford. It is Bradford, an African-American man of middle age, who speaks up after the applause subsides from Jesse Esparza's testimony. "That's going to be a hard act to follow," he says. Jesse smiles humbly and looks to the next speaker, San Joaquín County's Assistant Chief Probation Officer Carla Contente, who thanks Jesse effusively for his words. If there is tension on the streets between Black and Brown, between Latino and Asian, it is not felt among these leaders. Partners at all levels in the Alliance agree that a strong sense of identity is crucial for stakeholders to maintain an authentic voice within the greater coalition. But it is the coalition itself that enables the kind of broad changes needed to improve outcomes in those same communities. California, with its rapidly shifting demographics, seems uniquely positioned for this kind of coalition. At least for now. As US demographics continue to shift, however, California's Alliance could become a model for local-state partnerships, especially as federal programs like My Brother's Keeper are rolled out nationwide. During the rest of the hearing, Jesse's name becomes a stand-in for all those young men of color whom the movement has yet to reach. Another slate of bills has been prepared for 2014. Plans are in the works for more local Alliance campaigns in Hollister, San Bernadino, and Riverside. Meanwhile folks in LA, Fresno, and Oakland are rallying for major actions in the coming year, like November's ballot initiative that could retroactively reduce some drug possession charges from a felony to a misdemeanor, thus alleviating part of the legacy of the draconian "three strikes" law. The Alliance is not just passing meaningful legislation; it's helping to build a movement that reframes race politics and places boys and men of color at the heart of the narrative. The Alliance is not just passing meaningful legislation; it's helping to build a movement that reframes race politics and places boys and men of color at the heart of the narrativeyoung men like Jesse Esparza, who might never have worn a suit outside of a courtroom if not for his participation in the Alliance. "I always wanted to leave a legacy," he says. "And I thought that legacy was in the streets, being respected, being the hardest person out there, being known [as someone] not to mess around with. But I actually want to leave a legacy that's bigger than that. Someone who's actually known in this world for something else." 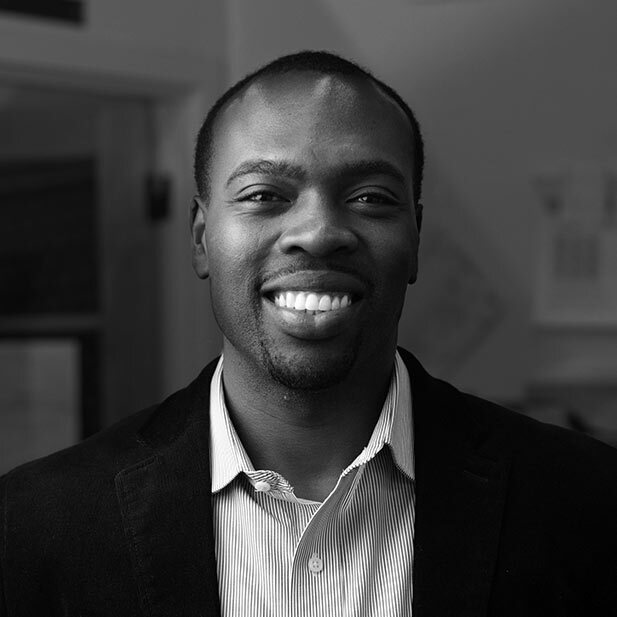 The Alliance creates a framework in which Jesse is integrated into the political process, helping to disrupt, rather than feed, the school-to-prison pipeline. If that framework holds, the substance of Jesse's legacy may finally become his to choose. What is the most important factor in creating a strong relationship with the young men you serve? Critical hope. Young people are more often told, in implicit and explicit ways, that they can't succeed. We hold high a strong belief in critical hopein their ability to succeed, lead, and be the change they wish to see in their families and communities. Critical hope goes from simply believing in someone to knowing. We know these young people are powerful and believe they are changing the world and will continue to do so. Starting from that point lays the foundation for the trust, love, and respect that every person deserves. What drives your approach to leadership development? Our work is not traditional leadership development by any means. We're pushing the envelope and trying to build a movement of young people of color to advance the interests of their families and communities. We're building the capacity of young people to address their trauma, find support among peers and mentors, and serve as advocates. These focus areas are addressed through a number of different activities including storytelling, policy advocacy, healing circles, and recreational camps. Our focus on youth taking these approaches is undergirded by our belief in equity and full inclusion. Young people, particularly youth of color, have for too long been locked out of the social and political processes that allow them to shape opportunities in their communities. We're doing away with that by taking bold action and empowering youth to be at the forefront of social change. What is the greatest challenge in getting policy makers to hear the concerns of young men in your communities? The greatest challenge is that most policy makers prioritize votes and moneytwo things young men of color cannot contribute on par with other more influential population groups. On the one hand, that's because they're either too young to vote or work; or, they've been failed by multiple systems and are not civically engaged nor have meaningful and stable income and earnings. Through our work, we've elevated their voices, but have more to do in terms of ensuring that these conversations turn into the policy and systems change that the young people demand.